Um, this stuff is the jam. Light, bubbly, easy and a perfect way to use up all of that yummy Summer fruit, I literally cannot get enough of this Sangria. We've served this Summer Sangria for both big parties and causal get togethers and it's a hit every.single.time. 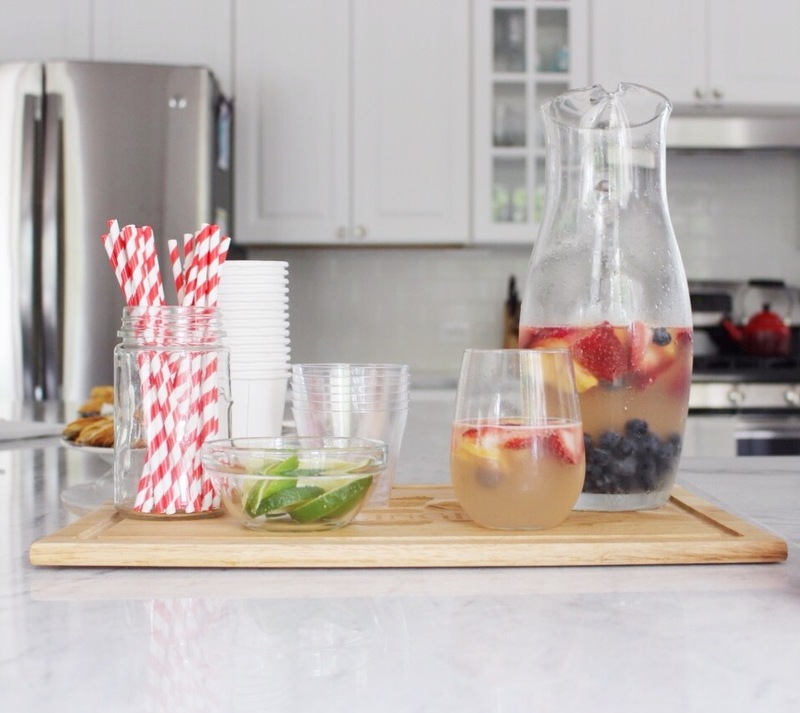 We had a ton of requests for this recipe during the babe's party so I promised I would blog it - and side note, even those who don't love wine thought this Sangria was worth a swig. Pro Tip: don't bother with fancy wine, head straight for the $5 bottles in Trader Joe's and get to mixing. Depending on the size of your crowd, mix equal parts wine and lemon lime soda. For reference, for the party, we pulled out a large drink canister, mixed one full bottle of wine, an equal amount of soda and 3/4 of the lemonade concentrate. If you'd like the Sangria to stay bubbly, mix small batches and serve immediately or mix in a vessel that can be sealed until ready to consume. This looks delicious! Trying it this weekend! Also, your nails are always perfect, I'm very envious! Sounds yummy! Love your nails too! Your nails!! You sure you can't go back to the salon and find the brand and number!? Haha! That is the perfect shade of pink, though!